Growing herbs is a great hobby. They add to your cooking, decorate your home and are easy to grow. 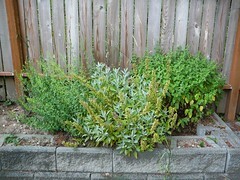 Many people believe that herbs will not grow properly indoors. This is certainly a long way from the truth. Many herbs will grow quite contentedly inside a home. However, there are a few areas which need a little bit extra thought. Below are the 3 most typical pit falls and the way to avoid them. 1. Sunlight. Herbs like sunlight. Try to keep your plants close to a bright window that catches plenty of sunlight. If the herbs begin to get long, weak stems then it is a sign that the indoor herb gardens craving additional sunshine. If you are unable to provide natural sunlight to your herbs then you should purchase a growlight. These are special lights which replicate sunlight and help your herbs to flourish. 2. Temperature. Nearly all of us like to be warm in winter. However our heating system dries out the air and can upset your herbs. You might discover that the plants flourish better with added moisture. To accomplish this you do not need to go out and buy expensive humidifiers, you may simply place your herb pots near a larger bowl which you can fill with pebbles and water. As your house gets warmer then the water will evaporate and the herbs will perk up almost instantly. 3. Pests. During the cold winter months many of the eggs laid by pests which attack herb gardens will be killed off by the cold. With indoor herb gardens the eggs are not killed off and you might unexpectedly find your plants are bug-ridden. If your herbs are in quite small pots these are incredibly easy to get rid off. You need to get ready a bowl of tepid water mixed with a small quantity of washing up liquid. Just turn the herb upside-down, holding the soil and roots in place while in the pot and swill the leaves around in the water. This will detach the pest and will not have an effect on the herb. If your indoor herb gardens are in larger pots then you will need to place the soapy water in a spray and spray the pests. This can take more time and you will need to keep an eye out for re-infestation since you are unlikely to get all of the eggs at once, but it’ll work just as effectively. So with plenty of light, humidity to compensate for your central heating system and a watchful eye for pests your indoor herb gardens ought to quickly be thriving. If you’re uncertain which herbs to start with, try considering which would be the most useful in your kitchen and set up with these. Through growing what you need you’ll soon realize the advantages plus enjoyment available from your indoor herb gardens. Indoor herb gardens are a great way to enhance your cooking and your home.